If you've ever played Cards Against Humanity and thought that you have just the sort of cheeky, vaguely profane sense of humor required to dream up the jokes and phrases on the black and white cards, we come bearing some pretty great news. The folks who make the hilarious and popular "party game for horrible people" are looking to hire some new contributing writers to do exactly that. 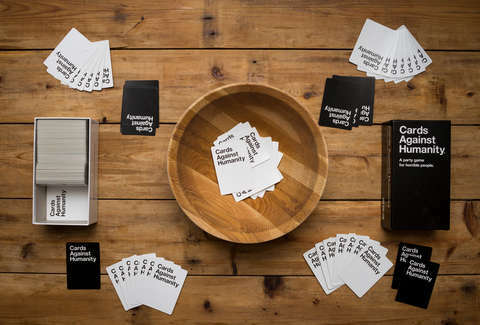 Per the official Cards Against Humanity website, aspiring card writers are welcome to apply to become a part of its pool of remote contributing writers for a chance to make $40 an hour composing sharp and punchy new cards for its various new game upgrades and refresher card packs. All you need to do is submit your best 15 white cards and five best black cards before August 31, and cross your fingers that they find them witty enough to welcome you to the crew. If you're not sure what makes for a good black card (the ones with a "blank" on them) versus a bad one, the application page provides a number of handy tips to help you out (e.g., the "blank" shouldn't come after and adjective or article). They also lay out exactly what they're looking for in a good white card ("show and don't tell"). Essentially, the key is to let your distinctly weird voice and perspective shine through with abandon. It's unclear how frequently you'll be tasked with coming up with new cards as they can only promise you'll be needed "sometimes," so don't expect to make this your full time gig. Still, being able to brag to your friends that your sick mind dreamed up whatever wacky and offensive cards you're all playing with should be currency enough.